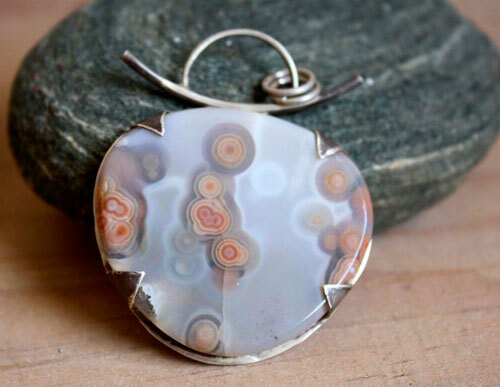 This pendant is made of sterling silver (925) made by hand in my workshop, and a beautiful ocean jasper. 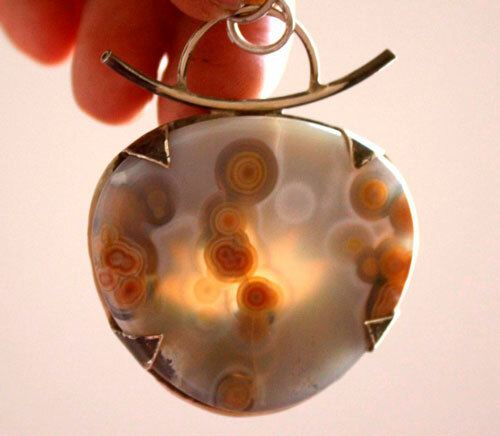 I set the stone in a modern slender design to follow the natural shape of the stone. 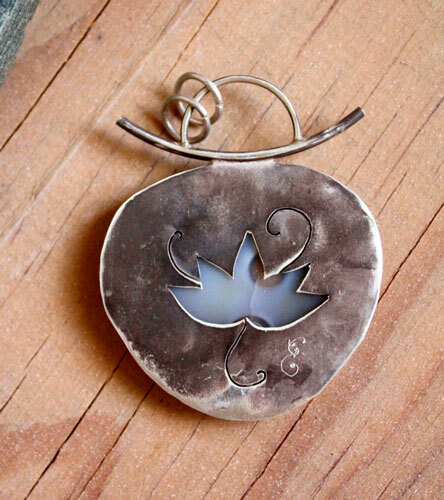 I sawed a lotus on the back of the pendant so that one could see the transparency of the stone which is really beautiful. 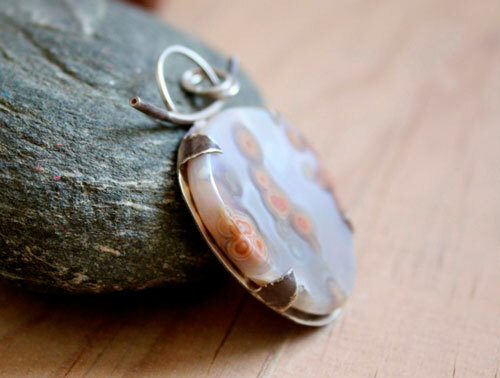 This ocean jasper is translucent white with orbs in shades of red, orange and ocher. It referred to two things in my little head: map or the primordial ocean. The orbs have first suggested one of those old navigations maps and colorful marking the islands with their contours and reliefs in colored lines. 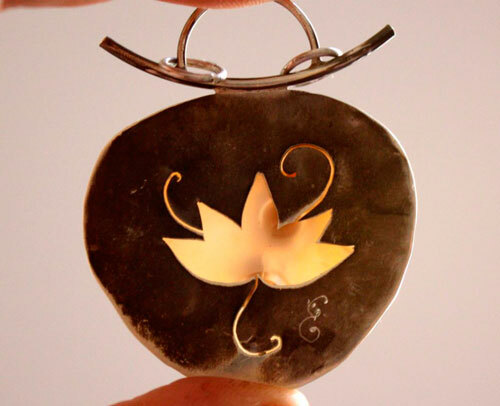 It is in this spirit that I have chosen to saw a lotus on the back of the pendant because in some beliefs, it is the first plant to float on the primordial waters and to give life. For example, it would be the form of the god of the Egyptian sun, Atum, when he came out of these waters (Noun) to create the world. This is also the lotus floating on the waters that rise to the main Hindu gods like Brahma, Vishnu or Shiva. 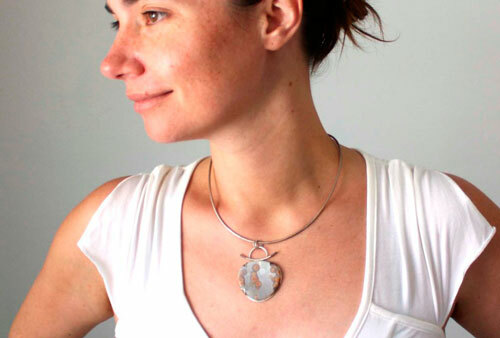 This pendant is therefore a hymn to life and creation. The surface is 5 x 4 cm. 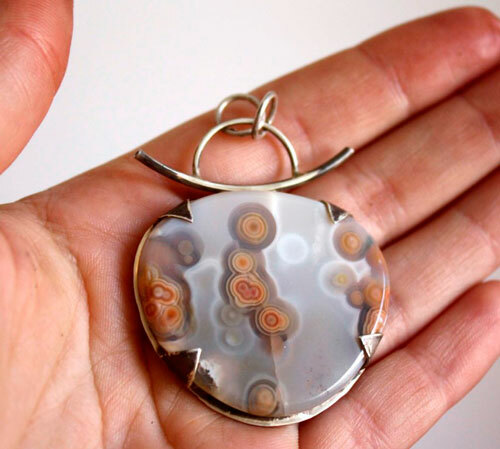 Tag: pendant, sterling silver, modern, unique, jasper, ocean, plant, gift, valentine, mother’s day, birthday, cabochon, semiprecious stone, lotus, map, island, sea, primordial, water, creation, mythology, belief, legend, India, hindu, Hinduism, Egypt, egyptian, gods.